Whether you’re a UX or UI designer, app developer, or just want to create some mockups of Mac OS X Lion apps for fun, don’t miss these free OS X Lion UI Element kits from designers Jonatan Castro and Joshua Geiger. 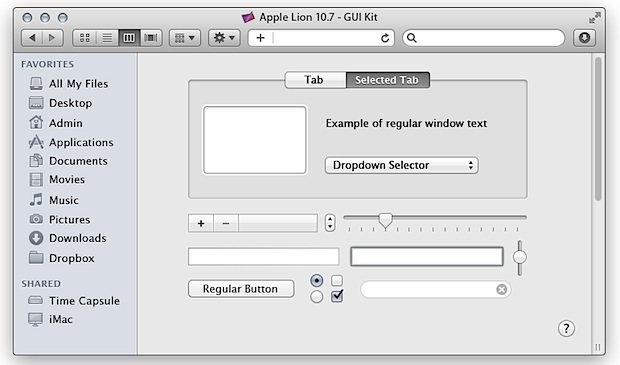 The GUI kits come as well labeled multi-layered PSD files that have all the main user interface elements from OS X Lion, ranging from sliders, dials, checkboxes, buttons, tabs, just about everything you can think of. The two kits are slightly different and combine to be fairly complete, with the second kit focusing more on Desktop and Finder elements. The only thing I can find missing is the blue active button you see in things like Save dialogs, but chances are the PSD files will be updated to include that sometime in the near future, and regardless both are well worth the free download. You can also download similar free GUI element PSD files for iPhone and iPad mockups too. It would be great if a stencil kit for OmniGraffle could be generated too! That would be much more useful than PSD files, I’m sick of Photoshops bloat and most of our mockups are done in Visio and OmniGraffle these days.